​My fingers clutched the chain-link fence until they bled as I was standing on the edge a busy boulevard. Suddenly I find myself fenced in with no way out. I was desperately banging on the fence but to no avail. As I traversed to my right several feet, I was stopped at a corner of that fence and it too was also stationed at the edge of a busy boulevard. People were driving by at the intersection of the fence where the boulevards met. No one outside the fenced in area seemed to care. No one can hear my screams as the windows on their vehicles were rolled up as they continued on. My thoughts racing through my mind were that some passers by were glad to see us all socially quarantined, some apathetic and didn’t care if we were sectioned off, and some simply didn’t know. As I frantically looked for an opening in the fence to get out, I gave up as I found none. Disheartened, I looked behind me and there were many people behind the same fences as me in the cordoned off city block. Everyone either had a rainbow T-shirt on or was wearing a tie-dye T-shirt in rainbow colors. There was very little grass, people were sitting on concrete generally smiling but crammed in to this city block but trying to make the best of their lives. There was a small tent in the middle case it rained. Otherwise we were exposed to the elements. Thankfully that day was mild, without rain. I walked around inside the perimeter stunned to see that people were generally upbeat as they lived their life and accepted their future behind this chain-link curtain that separated them from the rest of society. I could not remain upbeat after suddenly finding myself isolated from the rest of society. That was a dream I had very soon after I (finally) accepted my fate as being transgender when I was 43. I woke up from that dream frightened. However, instantly and absolutely I knew what it meant: I suddenly found myself inside the LGBT societal quarantine. The many already in there learned to not fight but quietly accept their city-block radius fate. God bless them if they can do that, but I cannot. I cannot accept being a looked down upon as a second-rate citizen by all those outside looking at us inside this fenced area. We are humans, formed and created by the same God professed by those who quarantined us socially. I cannot accept any of the “ewwww, look at them, they’re going to hell because they’re LGBT” that THEY place on us. I cannot accept they separate themselves from us. I cannot accept this division in our society for the sake of political gain nor assumed religious supremacy. I cannot accept how we are treated by politicians and many preachers as enemies, yet we are their neighbors down the same street they live on. I cannot accept it at all. 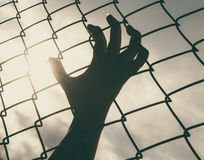 I’m still looking for a way out of that fence not only for me, but for everyone inside the societal quarantine who hasn’t enjoyed the same freedoms as I did the first 43 years of my life. We are people, saved by the same grace of God and who love this country dearly. So when someone like a seemingly insignificant Lady Gaga even briefly mentions the word “transgender” in a positive light, along with singing “One Nation Under God” a couple minutes prior in front of millions watching the Super Bowl, it’s something to find hope in. Finally, someone outside this fence we are trapped in sees us as humans and is attempting to break down this man-made social quarantine that controls and shames us. Yet many who don’t have access to millions of eyeballs watching them on TV do indeed see us as humans. They are doing God’s work locally by creating bridges of unity and tearing down the toxic “Us vs Them” in our country. This damned fence is coming down, I’m going to see to it.